My sister-in-law called me a few weeks ago to tell me a story about Noella-belle. 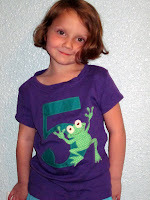 NB is obsessed with frogs and has a frog shirt that no longer fits. She turned to her mom and said, "It's okay that the shirt doesn't fit anymore, Shelley will buy me a frog shirt for my birthday." Talk about pressure. I started searching and wasn't finding anything I loved. And then genius hit. I remembered that my friend Sara makes a birthday shirt each year for her kids so I contacted her with my request. I let Sara have creative reign over the shirt and I think it's safe to say that everyone loves the finished product. that's fabulous! Sara makes such fun stuff. :) Glad you kept your "favorite" status.